What can we hope to gain for trypanosomiasis control from molecular studies on tsetse biology ? At times of crisis when epidemics rage and begin to take their toll on affected populations, as we have been witnessing with African trypanosomiasis in subSahara, the dichotomy of basic versus applied research deepens. While undoubtedly the treatment of thousands of infected people is the top priority, without continued research and development on the biology of disease agents and on ecological and evolutionary forces impacting these epidemics, little progress can be gained in the long run for the eventual control of these diseases. Here, we argue the need for additional research in one under-investigated area, that is the biology of the tsetse vector. Lacking are studies aimed to understand the genetic and cellular basis of tsetse interactions with trypanosomes as well as the genetic and biochemical basis of its ability to transmit these parasites. We discuss how this knowledge has the potential to contribute to the development of new vector control strategies as well as to improve the efficacy and affordability of the existing control approaches. Despite many decades of research on vector-borne parasites and their development in mammalian hosts, effective strategies have yet to materialize for control of any of the diseases with which they are associated. At the same time, a heavy reliance on insecticides and therapeutic drugs has resulted in the spread of insecticide resistance in many vectors and the emergence of drug resistance in parasites, threatening the availability of effective tools to combat these diseases. This scenario is apparent for sleeping sickness in Africa where there are currently more than half a million people estimated to have contracted the fatal disease. Most studies on Human African Trypanosomiasis (HAT) have centered on the biology of the causative agent, trypanosomes, as well as on its diagnosis and epidemiology. While these research efforts have turned trypanosomes into a model eukaryote to study novel mechanisms of gene expression and cell biology, there are no effective products forthcoming for disease control in the foreseeable future. Trypanosomes' antigenic variation in the mammalian host has hampered efforts for vaccine development. The current strategies for management of trypanosomiasis depend on active surveillance and treatment of infected hosts, and on limited vector control measures. These efforts have been restricted due to the lack of effective drugs, their high cost, adverse side effects, and the emergence of resistance to these drugs in parasites . Recently, there has been a welcoming and much needed push for the development of new anti-trypanosomal drugs, and hopefully these efforts will strengthen the repertoire of therapies available for management of this fatal disease. Nevertheless, strategic difficulties in accessing the rural populations often inflicted with this disease, the lack of sensitive diagnostic tools and the potential for emergence of drug resistance in parasites to these new drugs will continue to threaten the long-term success of these strategies. It is important to note that trypanosomiasis is a disease based on interactions among at least three organisms: the human, the parasite, and the tsetse fly. Interference with any of these interactions can prevent disease. The fact that the parasites rely on a single insect for transmission opens up many avenues for control via the control of its vector. In fact, tsetse control strategies have been widely implemented for the management of animal diseases. As domestic animals are now shown to be reservoirs for human disease transmission as well, treatment of infected patients alone can not be effective unless vector control is concurrently implemented . To date, most tsetse control efforts have been on a small scale involving trapping and use of insecticide sprays. A recent study looking into the cost/benefit analysis of various strategies has identified large scale, area-wide methods as being far more efficient and affordable for long-term tsetse control . The recent advances in molecular technologies and their application to insects have revolutionized the field of vector biology although progress in the tsetse field has been slow. With regards to trypanosomiasis, there are now genome sequencing programs for the parasite and the genome of the human host has been deciphered. In contrast, to date only a handful of tsetse genes have been identified, while most important proteins with relevance for insect metabolic pathway, saliva and trypanosome transmission are still awaiting characterization. This is in sharp contrast to the vast level of knowledge available for mosquitoes such as Anopheles gambiae, for which there is now an international genome sequencing effort in place, and other vector genome projects are currently being planned. For implementing genetic control, much effort has gone into the development of DNA transformation systems for the medically and agriculturally important vectors. There is no doubt that the availability of this technology stands to revolutionize insect genetics by allowing us to conduct basic studies for functional characterization of various genes and their products. It also promises the development of alternative control strategies such as transgenic refractory insects. It is contemplated that these genetically engineered refractory insects can be driven into natural populations to replace their susceptible counterparts and, hence, reduce disease transmission. The principles of this approach are being widely debated among scientists at large, and to evaluate the efficacy and feasibility of this strategy, various international committees are currently being established . In the case of tsetse, the development of trypanosome-refractory strains stands to immediately enhance the efficacy of at least one currently implemented area-wide control strategy, Sterile Insect Technique (SIT). While genetic transformation systems have been now established for various vector insects, the viviparous reproductive biology of tsetse has hampered the application of germ-line transformation technology in this insect. However, in addition to transmitting trypanosomes, tsetse flies have established symbiotic relationships with multiple maternally transmitted bacteria. These symbionts provide a unique opportunity for somatic transformation approaches . In this system, anti-trypanosomal gene products can be expressed in vivo in the symbionts in midgut and can directly interfere with the viability of parasites. Our ability to harness this system at its fullest however depends on a good understanding of trypanosome transmission in tsetse and the biology of tsetse symbionts. Insects have the ability to clear the pathogenic agents they encounter via a robust innate immune system. At the center of insect immune reactions is a diverse set of mechanisms ranging from phagocytosis, to activation of proteolytic cascades, such as coagulation and melanization and to production of various antimicrobial peptides [6, 7]. In the absence of memory and adaptive immune defenses, they rely on the recognition of conserved molecules common to specific groups of pathogens. Much of this response is initiated in the fat body of insects, where a variety of proteins and peptides with antimicrobial activity are synthesized and induce a systemic response to infection. The activity spectrum of immune peptides is diverse and can respond specifically to a pathogen or to various pathogen groups. In Drosophila and mosquitoes, the use of different receptor /signaling pathways have been found to allow for discrimination between different pathogen groups, prokaryotic versus eukaryotic. In addition to fat body, effector molecules, such as nitric oxide and the phenoloxidase cascade, expressed locally in the midgut are also increasingly being recognized as playing an important role in immune reactions in insects [8, 9]. Research development in the area of innate immunity has rapidly progressed in recent years, and the biodiversity of insects producing complementary information is fortuitous for vector biologists struggling to understand the genetic basis of vector-parasite compatibility. For many of the insect species studied, several genes and proteins have been characterized as well as the pathways to which they are tied. However, much of what is known is based on immune responses to bacterial or fungal infections. More advanced work is underway in the area of mosquito genetics and has shown that the mosquito is indeed capable of detecting the presence of the malaria parasite and mounting a pathogen-specific response, suggesting an active control of the level of Plasmodium infection by the mosquito. In A. gambiae, analysis of genes expressed in response to Plasmodium infections revealed a range of immune responsive genes that were upregulated in different tissues and could be correlated temporally and spatially to the passage of malarial parasites through the mosquito. Most species within the four subgenera of Glossina: fusca, morsitans, palpalis andausteni, are competent vectors for parasite transmission, although their transmission efficiently varies widely. When one examines the prevalence of trypanosome infection in natural tsetse populations, it is apparent that tsetse must also be mounting a significant level of immune defense, since trypanosome infections with T. brucei spp. complex parasites are typically detected in less than 1% of the field population [10–12]. Even under ideal conditions in the laboratory where all flies are given an infectious blood meal, transmission rates are between 1–10% depending on the fly species/strain and parasite strain [13–16]. The basis for this refractoriness is not known but is thought to involve complex interactions between tsetse species, their symbiotic bacteria and the genotype of the strain of the parasite acquired . The life cycle of the trypanosome in the tsetse fly begins when it feeds from an infected mammalian host. The non-proliferating short stumpy cells that are pre-adapted for life in tsetse fly rapidly differentiate into procyclic forms in the gut lumen, lose their variant surface glycoprotein, and express a new coat composed of procyclin proteins. The procyclin coat contributes to the establishment of infections in the fly . It has recently been shown that the procyclic cells express different procyclin coats during establishment in the gut and that the N-terminal domain of all procyclins are quantitatively removed by proteolysis in the fly, but not in culture . It has also been shown that the binding of a lectin (concavanalin A) to the procyclin molecule of the procyclic form cells induces multinucleation, a disequilibrium between nuclear and kinetoplast replication and a unique form of cell death . The surviving procyclic cells eventually proliferate in the gut (establishment phase) and flies can be scored with infections 7–10 days after acquiring an infectious meal. The subsequent maturation phase occurs in the salivary glands for T. brucei and in the mouthparts for T. congolense group parasite. Here, they first differentiate into attached proliferating epimastigote forms which then yield the infective, free-living metacyclic cells that are transmitted to the next host during blood-feeding by the fly. It is at this stage that parasites have been shown to undergo genetic exchange . The factors triggering this differentiation step are unknown. There is believed to be a critical period for maturation between days 8 and 11 after infection. One suggestion is that lectins have a role, since feeding lectin inhibitory sugars can block maturation. However, it is clearly crucial to investigate the role of other components of the immune system. Recently, to understand the role of tsetse immune responses for trypanosome transmission, we characterized several immune marker genes (defensin, attacin and diptericin) from tsetse and studied their transcriptional regulation in vivo. These results show that upon entry into the fly via the bloodmeal, trypanosomes fail to elicit a strong immune response, contrary to what is seen with Escherichia coli (Figure 1). Furthermore, tsetse immune responses can differentiate between the blood-stream form and procyclic parasites. The blood-stream form parasites which would be, acquired during the course of natural infections in the field, result in significantly less induction of the immune peptide gene transcription than their procyclic counterparts. Regulation of attacin, defensin and diptericin expression in fat body after feeding pathogens in the bloodmeal. Northern blots were hybridized to GmAttA (A), GmDefA (B) and GmDipA (C) cDNAs and results are also schematically presented. Fat body RNA was analyzed 8 and 24 h following bloodstream trypanosome feeding (Lanes 1 and 2, respectively), 8 and 24 h after procyclic trypanosome feeding (Lanes 3 and 4, respectively), 8 and 24 h after E. coli feeding (Lanes 5 and 6, respectively) and 8 and 24 h after a normal bloodmeal (Lane 7 and 8, respectively). This is a representative example of three replicate experiments. In other experiments where the parasite was introduced into the hemolymph of the fly via microinjections, again there was no upregulation of transcription of these antimicrobial peptide genes in fat body although similar microinjections of E. coli resulted in abundant and long-lasting response . However when we analyzed the transcriptional expression of these genes in fat body of flies with established midgut parasite infections, we were surprised. In these parasite infected flies, the same marker genes were being expressed abundantly in fat body although apparently their presumably synthesized products did not affect the viability of the parasites in midgut (Figure 2). Other flies that had been able to clear their parasite infections however no longer expressed these peptide gene transcripts. 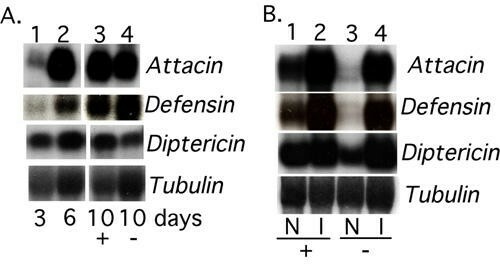 Regulation of attacin, defensin and diptericin expression in fat body during the course of parasite establishment and the immuno-competence of parasite infected and infection cured flies. A: Northern analysis showing gene expression in fat body 3 and 6 days following a parasite infected bloodmeal (Lanes 1 and 2, respectively), and after 10 days when flies were scored as infected (+) or parasite infection cured (-) (Lanes 3 and 4, respectively). B: Gene expression in fat body from flies with (Lane 1) and without (Lane 3) gut parasite infections 20 days after receiving the infectious bloodmeal, and their immuno-competence after challenge (Lanes 2 and 4, respectively). +, parasite infected; -, parasite cured; N, naive; I, immune stimulated. These results suggest that initially African trypanosomes do not evoke an immune response in tsetse – how they do this is at present unknown. As the parasite numbers increase in the fly gut after establishment in the ectoperitrophic space of midgut, they are recognized as foreign and an immune response is initiated in fat body. Why this response fails to clear the parasite infections is also unknown. It is possible that the eukaryotic parasites could be resistant to the actions of these immune peptides, or alternatively the peptides synthesized in fat body and circulating in the hemolymph might fail to reach and harm the parasites in their special niche in the midgut. Nevertheless, immune events early in the infection process in the fly appear to be crucial for disease outcome. In fact, in experiments where the immune system of the teneral fly was stimulated by micro-injection of either E. coli or LPS prior to providing the infectious parasites in the first blood meal, the infection rate in tsetse midgut could be substantially lowered (Table 1). Note. Numbers represent pooled samples from replicates for each treatment. The infection prevalence in the control groups served as the expected data against which other groups were tested. It might be possible to control parasite infections via transgenics by constitutively expressing in midgut the products that appear to adversely effect parasite development in the immune-challenged flies. These experiments are providing the first preview into tsetse immune mechanisms. For a complete picture of tsetse responses to trypanosomes, additional immune responsive genes will need to be evaluated not only from the fat body but also from midgut tissue. When gene products that interfere with trypanosome transmission in the fly are characterized as described above, constitutive expression of these products would be desirable in tissues where they can impact parasite viability. For these experiments, it is necessary to establish a DNA transformation system for tsetse. At the core of transgenesis is the process of genetic transformation, which for many insects relies on the microinjection of transposable elements, which insert themselves into insect DNA (germ-line transformation). Marker genes carried by the transposable element help identify the transgenic individual . Tsetse flies, however, have an unusual reproductive biology. There is no free egg stage; females retain each egg within the uterus. Following hatching and in utero development, one mature larva is deposited. Each female can deposit 3–4 offspring during its 5–6 week life span in the field. This viviparous reproductive biology undoubtedly complicates attempts to transform tsetse through egg microinjection. However, tsetse flies naturally harbor a number of symbiotic microorganisms, which can be exploited to express foreign gene products . Through such an approach, the insect cells are not transformed as in germ-line transformation, but instead foreign genes are expressed in the symbiotic bacteria (somatic transformation). Since the symbionts live in close proximity to the developing trypanosomes, anti-pathogenic products expressed in these cells could adversely affect parasite transmission. It has been shown that tsetse flies harbor three distinct organisms. Two of these are present in the gut tissue; the obligate Wigglesworthia glossinidia and the facultative Sodalis glossinidius. Both of these symbionts are enteric bacteria closely related to E. coli. The third symbiont harbored in certain tsetse species is Wolbachia, an obligate intracellular bacteria closely related to Rickettsia[24, 25]. Vertical transmission of Wolbachia is accomplished by transovarial transmission, whilst the other symbionts are transmitted through milk-gland secretions during the nourishment of the developing larva [26, 27]. Wigglesworthia has been implicated to provide the fly vitamin metabolites missing from its single diet, blood  and recent molecular analysis has shown that its small genome indeed contains an unusually high number of genes in the vitamin biosynthetic pathways. It has been possible to cultivate the Sodalis symbiont in vitro, and a genomic transformation system has been developed . It has also been possible to reconstitute tsetse with the recombinant Sodalis, and the recombinant symbiont has been shown to be successfully acquired by the intrauterine progeny . Now effective gene products need to be identified that can have anti-trypanosomal effects when expressed in Sodalis in tsetse midgut. The constitutive expression of the tsetse immune-responsive molecules, which trypanosomes apparently down-regulate to achieve their transmission early in the infection process, might provide one such approach. The identification of monoclonal antibodies (mAbs) with parasite transmission blocking characteristics and their expression as single-chain antibody gene fragments in the symbionts provides an alternative avenue. Towards this end several transmission-blocking antibodies targeting the major surface protein of the insect stage procyclic trypanosomes have already been reported . The relative ease of genetic transformation and gene expression in bacteria, and the multitude of potential antiparasitic targets which can be explored, makes this a desirable system for transgenic approaches. Should resistance develop in parasites against any of the expressed foreign gene products, it would be relatively easy to switch to express a different gene product. Alternatively, several target genes can potentially be expressed simultaneously in the symbionts to prevent the development of resistance against any one individual target. In order to interfere with disease transmission, the eventual goal of any transgenic approach is to replace the naturally susceptible population with their engineered refractory counterparts. One powerful potential driving system involves the use of Wolbachia symbionts, which confer a reproductive advantage to their hosts. Genetically engineered females carrying Wolbachia would thus have an advantage over uninfected, non-engineered females and spread more rapidly through the population. The functions of Wolbachia in the various hosts they infect are variable. One common reproductive abnormality they induce has been termed cytoplasmic incompatibility (CI), which when expressed results in embryonic death due to disruptions in early fertilization events . In an incompatible cross, the sperm enters the egg but does not successfully contribute its genetic material to the potential zygote. In most species, this results in a low number of viable eggs. The infected females have a reproductive advantage, over their uninfected counterparts, because they produce progeny after mating with both Wolbachia-infected and uninfected males. This reproductive advantage allows Wolbachia to spread into populations. In D. simulans in the central California valley, a natural Wolbachia infection invading naïve, uninfected populations has spread at a rate of over 100 km per year simply through the expression of CI . In order to understand the functional role of Wolbachia in insects, it has been possible to cure most insects of their Wolbachia infections by administering antibiotics in their diet. This approach, however, has not been feasible in tsetse, since the antibiotic treatment results in the clearing of all bacterial symbionts, including the obligate symbiont Wigglesworthia, and in the absence of these, the flies become sterile. In order to study CI expression in tsetse, uninfected flies need to be collected from the field and colonized so that appropriate mating experiments can be performed in the laboratory. As Wolbachia infected insects replace naive populations by virtue of the CI phenomena, they can drive other maternally inherited elements, such as the maternally inherited gut-symbionts Sodalis of tsetse into that same population. It has been proposed that multiple Wolbachia infections, in which an insect contains two or more different Wolbachia strains that are incompatible with each other, could be used to generate repeated population replacements or to spread Wolbachia into target species that already contain an existing infection [35, 36]. The analysis of Wolbachia strain types infecting different species of tsetse has shown that they are different and as such represent independent acquisitions . One vector control strategy that stands to benefit from engineered parasite refractory fly lines and from Wolbachia mediated mating sterility is Sterile Insect Technique (SIT). SIT is a genetic population suppression approach and involves sustained, systematic releases of irradiated sterile male insects among the wild population. Releasing sterile males in high numbers over a period of 3–4 generations, after having reduced population density by other techniques (trapping, insecticide spraying etc. ), the target population can be eradicated [37, 38]. There has been an ongoing debate on the effectiveness of SIT strategy for continent wide tsetse control given the high cost and time associated with mass rearing the large numbers of sterile males needed, and the potential for re-invasion of areas cleared of tsetse . While it may indeed be difficult to employ SIT in all tsetse habitats, it may be a very efficient and important tool within the context of an Integrated Tsetse Management Program. The recent successful eradication of G. austeni from the island of Zanzibar using such an integrated approach of population suppression followed by SIT has demonstrated the feasibility of this technology where applicable . Whether total eradication can ever be achieved or not has been and will continue to be debated, however the Zanzibar project has clearly shown that SIT can be a valuable vector management tool for selective foci. It is likely that the continued monitoring of vector populations is still desirable for SIT similar to other control techniques. Improvements in two aspects of the current SIT technology have the potential to enhance its efficacy for future programs . The first is the development of parasite refractory strains. Since the large numbers of male flies released can potentially contribute to a temporary increase in disease transmission, the incorporation of refractory traits into the SIT release strains will greatly enhance the efficacy of this approach, especially in human disease endemic foci. During the current field SIT programs, male tsetse are provided with a blood meal containing a trypanocide before release and no infections have been so far found in trapped released sterile males. The second is the use of Wolbachia mediated CI as a method of inducing sterility as an alternative to irradiation. With CI, the release strain of tsetse would carry a Wolbachia infection that would induce CI when males are mated with wild females. The competitiveness of these males would be expected to be much higher than irradiated males and as a result fewer insects would need to be released in order to achieve the same level of sterility in the wild population, decreasing the cost of the approach significantly. This strategy is dependent on the use of a very efficient sexing system. If Wolbachia-infected females are released in sufficient quantities, then Wolbachia would have the opportunity to invade the target population, which would render subsequent releases ineffective. 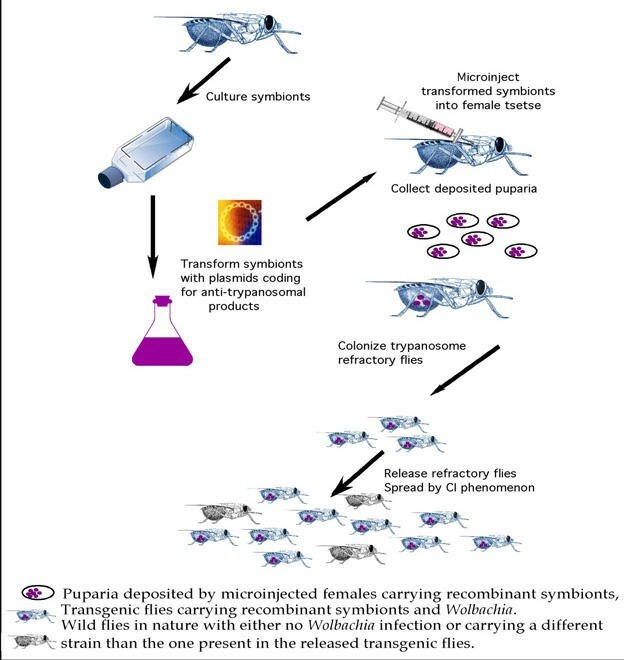 If it were impossible to guarantee extremely low quantities of released females, then it would be possible to incorporate low levels of irradiation with Wolbachia induced sterility to prevent released females from successfully reproducing. This approach has been successfully tested in Culex mosquitoes . Understanding the molecular and cellular basis of trypanosome transmission in tsetse is of fundamental significance, but in addition these experiments can result in new applications for vector control. Since the symbiont-based transformation system can be used with ease to express gene products in tsetse midgut, these studies are also of significance to identify candidate genes that can be expressed to confer refractoriness in tsetse (Schematically shown in Figure 3). From the preliminary studies with the tsetse immune system, it appears that trypanosomes have developed abilities to also manipulate their insect host to mediate their transmission. In future experiments, one of our goals is to understand how this very heightened immune sensitivity in the parasite infected tsetse host affects its viability and fecundity. Symbiont-based transgenic approaches. The cultivation, genetic transformationand reintroduction of recombinant symbionts to tsetse by micro injection is schematically depicted. We are grateful to colleagues in the laboratory, Rita VM Rio, Leyla Akman, Jian Yan, and Youjia Hu for their contributions to this work and to Irene Kasumba for excellent technical help. This work was supported by NIH/NIAID-AI-34033 and the Li Foundation awards to S.A.